The Public Relations committee has revamped our offering of contests and has created five new contests for 2014, all with a deadline of October 1st. It’s easy to participate. Let’s take a quick peek at each one. 1) Promote Your Grange Creative Video Contest: Create a video promoting your Grange. The video can be any length, and of any theme. 2) Grange Micro-Promotion Contest: The 140-character message format calls for concise, engaging writing. Promote the message of the Grange by writing a compelling promotion in less than 140 characters. 3) Show off your Grange Marketing Materials Contest: This contest is designed to honor innovative and effective marketing initiatives. Granges are asked to submit one method that they use to publicize and promote their Grange. This could be a poster, brochure, booth at a community event, community service project, special event, etc. The sky is the limit! Write a description of 250 words or less, and include a photo or sample piece to accompany the description if appropriate. 4) Best Cooperative Partnership Contest: An integral part of Grange public relations is partnering with other local groups and organizations. This could be a co-hosted event, a co-sponsorship of a project or initiative, a project to benefit or honor a group/organization, and so much more! Write a description of how your Grange has integrated/utilized a Cooperative Partnership, and include a photo to accompany the description if appropriate. 5) Social Media Participation Contest: Create a Buzz about your Grange, its projects, activities and events by managing a proper Facebook or Twitter Page. This contest is open to all Community Granges, Pomona Granges and Junior Granges. Pages must be active at any point within the period of November 1, 2013 - October 1, 2014. 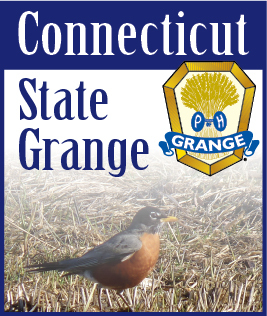 All of the details, rules, and information for the contests can be found on the Connecticut State Grange website at www.CTStateGrange.org, and will also be available in the Blue Book. Entries should be mailed to Robert Charbonneau, 102 Spring Street, Meriden CT 06451, or sent via e-mail to publicrelations@ctstategrange.org. We hope that the new variety of contests will appeal to Granges of all sizes - as the saying goes, there’s something for everyone.